It's been well-documented that I love mysteries of all sorts. I recently devoured three, all of which I recommend--but with varying degrees of enthusiasm. I Hunt Killers, the first in Barry Lyga's series featuring Jasper Dent better known as Jazz, a serial killer's son, ended with a cliffhanger--a seriously obnoxious one. Game was released about two weeks after I finished “Killers” so my wait wasn't too painful. But, Game goes beyond cliffhanger. It leaves you plummeting off the cliff with no way of knowing or guessing what the landing will entail. Billy Dent, Jazz's serial killer father, roams free to continue his dastardly deeds while Jazz searches for him in New York City. In contrast to his demented father, Jazz has come to his own understanding of humanity and his place in the world. People are real, Jazz told himself, repeating his mantra. People matter … Jazz had always thought that his past was his own burden to bear, but could it be possible that he was meant to have people around him? Was this the true meaning of “People are real. People matter? Jazz confronts his past, his own emotional pain and commits himself fully to finding and bringing down his father. Connie, his girlfriend, goes against her parents' wishes and her own common sense to follow Jazz to the city with the intention of helping him, even saving him from whatever may come. I closed the pages of the second in Lyga's series, frustrated and irritated. Everyone I liked best in the novel was heading down a winding road toward a collision. Nothing is resolved, and this does not read as a complete story. 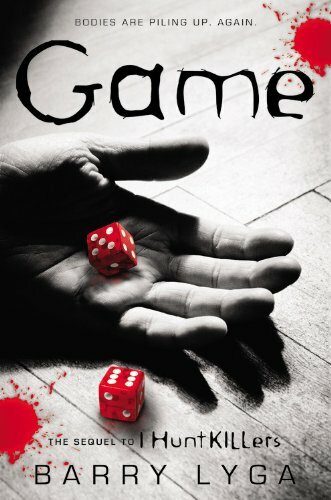 I haven't found a date for publication of the sequel to Game. So it goes. I'll just have to wait. I admit to a proclivity, an irritating one, of picking up books in the middle of a series, reading them and finding that I am a bit lost. Sarah particularly enjoys mocking this unique quirk of mine. 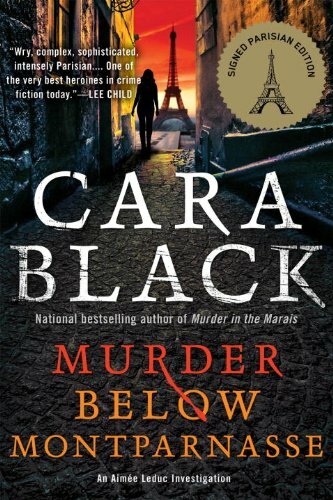 Although it's the thirteenth book in the Aimee Leduc series set in Paris, Murder Below Montparnasse grabbed my interest. Much of this is thanks to Black's descriptions of Paris, which create a portrait of the city. She captures its unique beauty. Five minutes later she emerged from rue Dlambre by Cafe du Dome, where aproned men shucked oysters on ice and waiters added lemons to platters of fruits des mer. She crossed Boulevard du Monparnasse. Patrons grouped on rattan chairs under the red facade of Cafe de la Rotonde, the fat thirties-style neon letter of its marquee a beacon. Not long after being hired to protect a unique work of art, Aimee discovers that her client has been tortured and murdered. Never deterred, she continues her investigation into the shadowy past that makes this painting valuable enough to kill for. >Atmospheric writing, a solid mystery and memorable characters both whimsical and strong, create a solid backbone for the Aimee Leduc Investigator series and I will definitely be checking out more from this unusual series (probably out of order, of course). 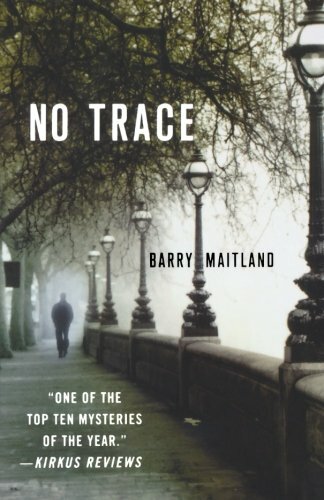 No Trace is another mid-series book I picked up and had to untangle a bit due to the already-established characters. However, despite that, I very much enjoyed this mystery set in London. Tracey Rudd, the daughter of artist Gabriel Rudd who is best known for his award winning work Dead Puppies, is missing without any clue as to what could have happened. The inspiration for Dead Puppies followed the suicide of his wife, but now his waning fame has a new inspiration. His daughter's disappearance brings forth a new artistic exhibition featuring the search for Tracey. D.C.I. David Brock and Detective Sergeant Kathy Kolla delve into solving Tracy's disappearance with its weird twists and turns developing into a disturbing theme of death inspired art. Set in London with a backdrop of oddities and twisted values emerging from the art community, the two detectives attempt to solve the unexplainable disappearance. The father's desire for fame and admiration trumps his love for Tracey and makes solving the crime difficult for the detectives. Gabriel Rudd parlays his devastation into a spotlight aimed straight at him and his newest creation to commemorate his kidnapped child and the mystery surrounding her. He now has a new tragedy to weave into art. No Trace offers a cleverly told story with an inside view of an eccentric community. The cavalier father's coldhearted exchange of tragedy into art will bring a shudder to your heart and sense of humanity. If you enjoy BBC crime dramas, you'll most likely find the Brock & Kolla mysteries suiting your taste.